Suppliers to European automotive OEMs have long understood that welding nuts, studs, bushings and other components to stamped parts is out, and that fastening them mechanically in the die is in. Simply, if you want to be competitive in that market space, in-die fastening is required. Want to see just how versatile and complex in-die assembly processes can get? Check out this sample of parts being assembled in-die at various metalforming facilities. From top to bottom: a seat part with pilot pin, processed at 35 strokes/min. with an installation load of 3 metric tons; a ball-pin application that runs at 45 strokes/min. 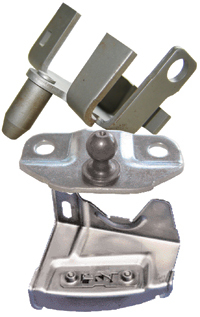 ; and a door-hinge bracket with a floating nut bracket, which runs two-out at 40 strokes.min. MDS Fastening Systems supplies the equipment and the engineering support (fastener selection and die design) metalformers need to automate their fastening operations, so we asked Lanni to establish the lay of the land in the application of this important and growing technology trend. “We’re seeing a big pickup in interest in the technology from stampers because their customers are requiring that they move in this direction,” Lanni says. “There’s initial concern about possible press slowdowns when in-die automation is added, as well as concern for added setup time and a possible reduction in run time. But the reality is, if a system is properly engineered and planned for, our customers typically only experience an additional 5 min. of setup time related to the in-die assembly automation equipment. And, the systems can feed and assemble at the same run rate as before the press was automated—special high-speed feeders are rated at 800 parts/min., or as many as eight different assembly heads receiving fasteners in the die at a maximum press speed of 70 strokes/min., depending on the size and shape of the part being fed. The benefits of assembling parts in the die are numerous—one operator runs the press and monitors fastener installation, with no need for secondary operations and the floor space, energy and manpower required. Logistics costs drop, as bins and cartons of in-process parts inventory no longer need to travel the shop floor to and from secondary operations. And, shops that assemble mechanically rather than using welding to attach nuts and other fasteners avoid harmful weld fumes and spatter, and the associated cleanup costs. Lastly, parts can be assembled without concern for health or technical issues surrounding the fabrication of precoated and prepainted materials. Of course, careful consideration of the type of fastener used is critical, as is the design of the fastener-installation equipment developed to feed the fasteners to the die, insert them in the die and ultimately onto the stamped part. Otherwise metalformers may not obtain the desired results from their capital investment. Asked about common hurdles that can cause an in-die fastening system to stumble, Lanni starts by focusing on fastener selection. The riveting-style nut, on the other hand, is growing in use for in-die automation, Lanni says, particularly in applications involving advanced high-strength steels (AHSS) and when working with very thin sheet. These nuts feature a collar that protrudes completely though the material and extends out the opposite side. The collar then gets folded back over on top of the nut in the press to create a joint strong enough to satisfy the design requirements of AHSS stampings. Other trends identified by Lanni include development of new styles of fastener feeders that generate less noise and are less likely to jam; and development of system components that fit together with quick-connect fittings to allow stampers to quickly move the equipment among setups. Also, systems can be designed to feed not only nuts and studs, but special fasteners such as positioning pins, spacers and ball pins. Working with the die designer on implementing an in-die fastening solution, Lanni strongly suggests that the stamper also bring the supplier of the feeder and head and fastener into the process from project inception. This will help ensure that the heads and fastener-delivery mechanism do not impede the functionality of the die. Yet another concern Lanni expresses relates to operator training. “Often, we’ll perform training at PPAP, and then the stamper won’t run the die for another 6 to 8 months. By that time the operators have forgotten everything that we taught them. If they forget to follow the proper sequence of operations, it can take a lot longer to set up the system and, at worst case, the heads can crash. “In particular,” continues Lanni, “a common error we see is a stamper installing a head that already contains a nut left over from a previous run. In this case, when the die is set and the press begins to stroke, the nut may already have been set on the lower die before the strip gets there. Then, when the strip arrives and the ram comes down and makes a hit, you’ve already set a nut. Then a second nut could be fed to the same spot. Result: a double-hit and a blowout.” The moral to the story: Don’t thread the sheet until the heads have been inspected and installed.